While a crown and bridge replaces a single tooth or 2 or 3 consecutive missing teeth, to replace multiple teeth or even a full row of teeth, you should talk to our Wakefield dental team about restorative care with a custom partial or full denture. 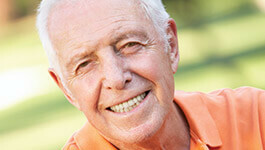 A partial denture is designed to help patients replace a few missing teeth. Those replacement teeth are spread across a gum-colored base and fit around existing teeth like a puzzle piece. Most traditional partials are secured by either clips or brackets. A full denture replaces a row of teeth. Full dentures are typically held in place with suction or adhesive found at a pharmacy or grocery store. In many cases, treatment with dentures is completed in just a few visits, starting with a consultation with Dr. Schumacher. Using his expertise as a prosthodontist, he designs a beautiful and natural-looking denture that helps you enjoy better oral health, functionality, and confidence. In addition to considering a traditional partial or full denture, you may also want to consider treatment with an implant-supported partial or full denture. Dental implants enable patients to achieve results that feel even more secure and natural than what can be achieved with traditional partials or dentures. Call our Wakefield dental office to learn more about each option. We would be happy to answer your questions or schedule a consultation visit for you.